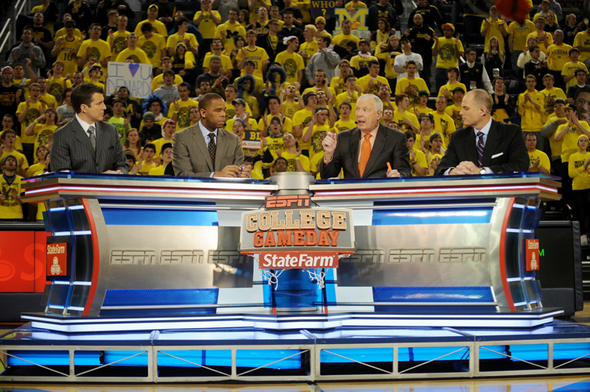 Posted on Sat, Feb 18, 2012 : 12:29 p.m.
ESPN's College Game Day anchors (from left) Rece Davis, Hubert Davis, Digger Phelps and Jay Bilas film a segment in front of Michigan basketball's Maize Rage during a taping at the Crisler Center on Saturday morning. There was a Jalen Rose cutout and signs touting affection for Zack Novak. One sign read "LinSanity" in homage to basketball's newest sensation, New York Knicks point guard Jeremy Lin, while another showed "TimSanity," giving a nod to theMichigan basketball team's sophomore wing, Tim Hardaway Jr. There was love for Michigan football quarterback Denard Robinson and coach Brady Hoke, and subsequent appearances by both. The Michigan basketball program, and athletic department in general, took center stage Saturday morning as an estimated 1,500 people made their way inside the Crisler Center for a live airing of ESPN's College Basketball GameDay. The program was broadcast live from Ann Arbor for the first time, a tune-up for the 17th-ranked Wolverines' 9 p.m. matchup with No. 6 Ohio State. Students began lining up at 5 a.m. Roughly two hours later, while fans were being entertained by a D.J., Michigan basketball coach John Beilein showed up with donuts. Inside the arena, fans caught a glimpse of the 'GameDay' set, with plenty of '#BEATOHIO' references all over the building, including the new Crisler Center jumbotron. 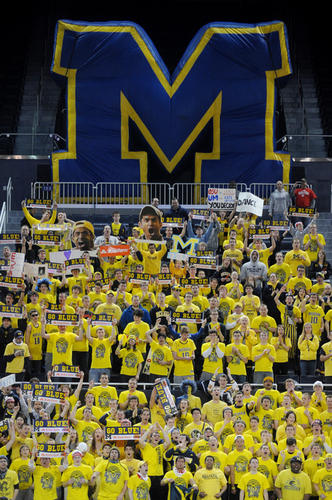 Michigan fans cheer in the stands before the start of a taping of ESPN's College Game Day at the Crisler Center on Saturday morning. A myriad of signs littered the maize-clad student section, including love messages for Robinson and Novak, affection for senior Stu Douglass' hair and several anti-Ohio State banners. One sign read: "Ohio State has Casey Anthony, Michigan has Kate Upton. You decide." The festivities officially began at 10 a.m., before Beilein sent the crowd into its first roar of the morning by entering Crisler from the Blavin Tunnel to do a live on-air interview with ESPN's Rece Davis. Robinson sent the crowd into a frenzy at 11 a.m., running out of the tunnel and joining the student section. Robinson's pre-taped intro with Davis, Hubert Davis, Jay Bilas and Digger Phelps served as the lead-in for the show's second hour. The question-and-answer session revealed several intimate topics about the senior co-captains. Novak's favorite show is Storage Wars. Douglass' dream date is with women's basketball senior Courtney Boylan, his girlfriend, while Novak's would be with Australian actress Margot Robbie. Although, Novak said he wouldn't mind joining ESPN sideline reporter Erin Andrews for a date either. "If either want to go out with me," Novak joked. "I'd be fine with that." The show concluded with Robinson attempting to throw a football the full length of the court into the basket. He missed his first few throws, but then instinct kicked in. Robinson tucked the ball, ran the length of the floor and converted a layup. As for the game predictions? They were unanimous. Both Hubert Davis and Phelps went with the home team. They chose Michigan. Sat, Feb 18, 2012 : 9:37 p.m.
Actually, he tucked it &amp; ran, fumbled at the goal line, missed a dunk, THEN converted a lay-up. Quite hilarious. This will give Suckeye fans something to talk about until football season. Sun, Feb 19, 2012 : 8:13 p.m. This article is full of factual inaccuracies. Novac never said he would go on a date with Erin Andrews. He said he would go on dates with Margot Robbie or Kate Upton. This is vital information people! Get it straight! Sat, Feb 18, 2012 : 9:02 p.m. This is all so great for the MAIZE &amp; BLUE KABOOOOM! Sat, Feb 18, 2012 : 7:16 p.m.